Faiyaz Koya says, Zealand and Fiji are natural trading partners. The Minister for Industry, Trade, Tourism, Lands and Mineral Resources, made the remarks while officiating at the New Zealand – Fiji Business Council Mission at Tanoa Plaza, Suva yesterday. “We must work together to reach the full potential of our relationship by exploring means and ways of further engagement. “Two-way trade in goods of the two countries reached $992.2 million in 2017. “And around $71 million worth of New Zealand investments were registered last year in tourism, services, wholesale and retail sectors. As a Government and Ministry, Mr Koya said they stood ready to work side-by-side with the business community in New Zealand to further ignite the trade and investment between the two countries. “In order to strengthen our trade and investment relations, we have established the Fijian Trade Commission office in Auckland, earlier this year,” Mr Koya said. “Through the Trade Commission we will redouble our efforts in attracting more investments and market for Fijian Made products. “Furthermore, our policies are dedicated towards developing emerging markets in order to forge new relations, whilst encouraging re-engagement with our traditional partners in order to create new trade and investment opportunities that benefit us all. “One area that I believe has tremendous potential is the business process outsourcing sector. “Not only is the Fijian workforce talented, we are also English-speaking, and Business Process Outsourcing (BPO) services in Fiji are available at a much cheaper cost than in New Zealand. Mr Koya stressed that the time to invest in Fiji and your business has never been more ideal than now. “With our consistent policies based on fairness, inclusive growth and empowerment, we have put Fiji on a new course,” he said. “We have our eyes firmly set on sustainable economic growth and on achieving greatness. “We are determined to not only cement Fiji’s position on the global map but to steadily transform ourselves from a developing country into a modern nation state. “I wish to reiterate that New Zealand and Fiji are close and important economic partners and we must work together to reach the full potential of our relationship. 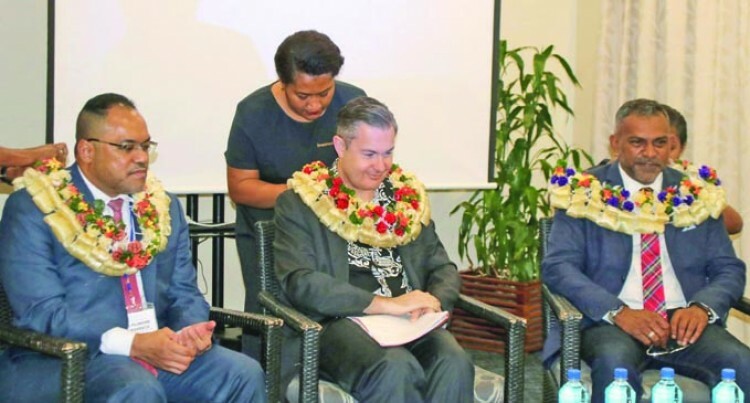 New Zealand’s High Commissioner to Fiji Jonathan Curr said: “The support of your government for the economic relationship is important for business on both sides of the Pacific Ocean. He said the total economic relationship is valued at something like $1 billion. “Last year, over 180,000 Kiwis visited Fiji as tourists, consistently ranking New Zealand as Fiji’s No. 2 source market supporting its tourism industry, local economy and local jobs,” Mr Curr said. “New Zealand firms are also one of the largest groups of investors in the Fijian economy, covering tourism, services, wholesale and retail, and transportation, storage and communications. “We rank second by number of investment projects and fourth by value in 2017. “Fiji is clearly important to us, and we to Fiji. “We can no longer afford to think of an economy as sophisticated as Fiji as only a reliable food and beverage market, or just another sales channel for international brands traded through New Zealand and Australia. “We should be looking at future opportunities, and the skills and talent that we might be able to draw on. “There are hi-tech software companies in New Zealand that are currently working with Fijian partners, in mobile telephony, app development, and maybe future services based on new technologies such as blockchain. “You no longer need to migrate to New Zealand and Australia to develop software on a computer. “You can do that from anywhere in the world. So why not do that with Fijians, or in Fiji? “You are important partners of the New Zealand government and the Fijian government. “I can’t speak for Fiji, but I can assure you that the team at the New Zealand High Commission, New Zealand Trade and Enterprise, and Ministry of Foreign Affairs and Trade stand ready to assist you.